7. Download successfully finished. Use Close to end program. In first picture from left you can see an USB-UART Adapter with CP2102 Chip. This can be connected with the aid of the cable to the jumper on the USB-UART adapter and OOBD-Cup v5 NG. Contained in the package you will find the actual flashloader- and firmwarefile the flashtool stm32flash and thre batchfiles for windows. The flashtool stm32flash is available for a windows surrounding an as an binary for linux. Three batchfiles are in regards of the purpose as “flash flashloader only” (stm32flash_bootloader_only.bat), “flashen firmware only” (stm32flash_firmware_only.bat) and “flash flashloader und firmware - All-in-One” (stm32flash_all.bat). For the initial flashprocess after hardware assembly and / or buying of an DXM-BT module we advise to use “stm32flash_all.bat COMx” variant, because with the call of the batchfile the bootloader and the firmware will be flashed in one go on the OOBD-Cup v5 NG or DXM-BT. Note: In regards of the hardwaredescription for a possible USB-UART interface you can only see the necessary jumper bridge of the OOBD-Cup v5 NG as an overview. Before the flashprocess can be started you have to assure that the USB-UART interface is on the one hand connected with the PC/Laptop that is used for the flashprocess and on the other hand the connections to the RxD/TxD/GND wires between USB-UART and DXM-module of the OOBD-Cup v5 have been established. Furthermore the Boot0-Jumper (Pin 1/2) of the jumper block JP2 has to fit. After processing the stm32flash_all.bat in a first step the batch tries to readout the hardwarerecognition of the STM32F103C8. If this was successfull you should see an output with the following informations. The first rows of the output show the result on an not succesfull flash attempt, were the connection between the USB-UART and the DXM-module could not be established. After the first third of the output you can see the information given out in regards of an succesfull connection from the stm32flash_all.bat on COM5 with the DXM-module. After pressing any key the flashprocess will be started. After successful completion of the flashprocess with the flashloader (100% Done) the next step is in regards pressing any key to start the flashprocess of the firmware. After the sucessfull flashing of the firmware (100% Done) the firmware will be started automatically (Starting execution…). Hereby you should hear a double beep of the buzzer. If this is not the case and the device is an OOBD-Cup v5 NG, then the mounting of the buzzer (SG1) and the correct junctions has to be varified. 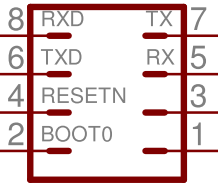 This step is only for completeness to the change of UART-Interfacespeed of the BTM182 / BTM222. After the initial flashprocess (see chapter 1) the interfacespeed si set automatically, so that this is not needed for the first bringing into service. To program the BT- chip you need to connect the USB-serial Adapter as shown above to the BT-PINS! !.